"I've always worked in porcelain making sculptural organic objects with tactile surfaces. In this new work I combine throwing with hand-built elements, making purely functional pieces - something I don't do very often. You can never compete with nature but I wanted to make a vase that is as beautiful with or without a flower. Something you leave out when the flowers have gone over." 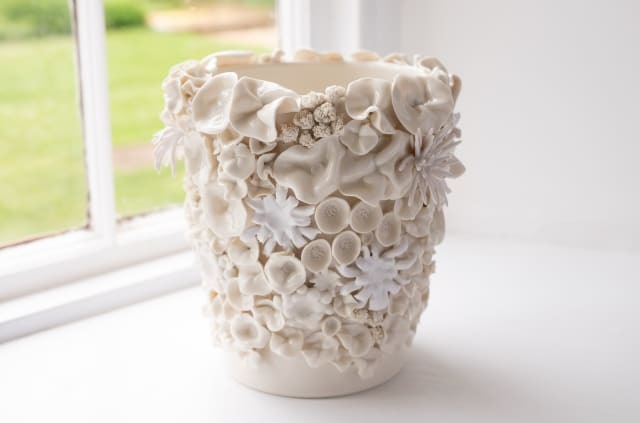 Emma's work has a joyful sense of creativity and almost disturbing abundancy, her recent porcelain pieces decorated with delicate petals and flowerheads clustered around pared back, clean-lined vessels. The look is organic yet uncluttered, celebrating the strange beauty of plants. Her range of Ribbon Vases in delicate shades of blush pink and pale jade are similarly functional as well as beautiful objects for display. Emma is a graduate of the Royal College of Art in Ceramic and Glass following undergraduate studies in Bath.